The latest Grey Heron population trends from the Heronries Census are discussed on the Grey Heron page in the BTO's BirdTrends report. The modelled annual population estimates for the UK, now spanning more than 80 years, show a long-term increase. We think there may be several contributory factors to this, including improvements in water quality, a reduction in persecution and an increase in suitable nesting and feeding sites as gravel pits have been flooded and restored. of Grey Heron: yellow - counted, red - imputed from other years' data. Overlain on the increase are dips in population caused by exceptionally cold winters, especially those of 1946/47 and 1962/63. Each dip has been followed by recovery within a few seasons. The UK Grey Heron population declined slightly at the start of the current century, before a steep decline occurred around 2010, following successive severe winters. Given the history of the population, however, the recent trend raises no conservation concern. The most recent Heronries Census estimate of UK Grey Heron population size is 10,713 apparently occupied nests in 2017. Heronries Survey 2018 provided the most complete coverage ever recorded in any one year, and produced a provisional population estimate of 10,262 apparently occupied nests. Heronries Survey 2003 occurred when population levels peaked and therefore, although fewer sites were covered than in 2018, it provided the highest count of active nests ever recorded in any one year, with 10,411 apparently occupied Grey Heron nests counted in the UK (out of an estimated total of 13,797). The map shows the active heronries known that year. There were none in Shetland or the Channel Islands. The Republic of Ireland was not covered (although a few counts were received). There was a concentration of large heronries in Cheshire and Greater Manchester and another in the London area. Estuaries and large lakes typically hold large heronries. Exposed coasts, especially west-facing, are generally avoided. 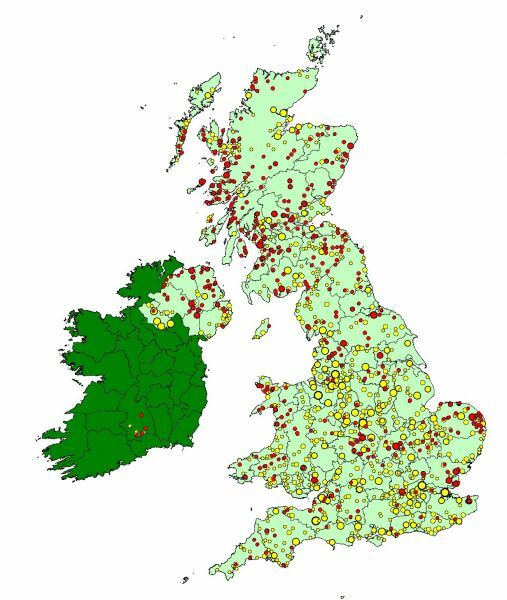 Upland regions are occupied but heronries there tend to be relatively small.